Curious about exactly how the term "kettle" came to be applied to migrating aggregations of Swainson's hawks, I have recently consulted The Birdwatcher's Companion by Christopher Leahy, indispensable I think for anyone who loves birds and nature. Leahy defines a kettle as "a flock of migrating hawks or other soaring birds spiraling upward on warm air currents." Alright so far, but he goes on to explain the etymology of the word--"because of the form of the rising thermals, the birds riding them take on the form of an inverted cone and suggest the whirlpool effect created when one vigorously stirs a kettle of liquid." I'm not so good with that part. I had always had a slightly different visual, thinking the birds rising up with the thermal resembled the funnel shaped cloud of steam emanating from the spout of a tea kettle. Now as I sit in the side door of my van near Marana and watch the Swainson's kettling above me, I'm convinced mine is a better visual than Leahy's. This kettle contains well over one hundred birds, some so close they are frame filling, some at the top of the kettle so far away they look like specks with my ten power Zeisses. I have my 600 tripod mounted, camera pointed skyward, tripod legs extended so I can shoot almost straight up without bending my knees. I hate shooting at this much angle, but bird photographers can't be choosy. You take what you're given. At least I've finally learned not to put extenders on the lens for flying birds. I've never gotten a sharp flight shot using extenders. Eye level, with the sun directly behind the camera is best, so my sharpest images will be those of the birds just exiting the field and climbing to reach the thermal. I've seen flight shots from a shooter in Florida who hand holds his 600. Supposedly. He could be lying about the lens size he uses, or he could be superman. One of those two things. There's no other explanation for the super sharp flight images he has on his website. I've been here an hour, and only the occasional vehicle carrying field workers has passed by on this rural road five miles or so from the busy interstate. I am moving constantly to avoid having the overhead utility wires slice through the body of whichever hawk happens currently into the viewfinder. This is an upper body workout, and those occasional field workers slow and gawk like I am from Mars. Some of them must be aware of the hawks coming and going from their fields this time of year. Perhaps field workers are so immersed in the nature scene they take it for granted and can't relate to the awe and wonder of the city bound. I think I'm near Marana, but Marana is one of those amorphous rural entities that encompasses, in its own collective mind at least, vast areas of farmland and desert scrub that will be developed in someone else's lifetime into the urban bridge connecting Phoenix to Tucson. It's a new concept across the sparsely populated West--rural sprawl, but the "sprawl" is only on the maps. So, maybe I'm actually in Marana, but from a Swainson's Hawk perspective I am simply in a prime refueling spot on the long journey from the northern plains to Argentina. On one side of the road is a large, recently plowed field surrounded by croplands and mesquite brushland. The field holds a couple dozen Swainson's and presumably, though I can't detect them, hundreds of large grasshoppers. Although I know Swainson's is not my favorite daytime raptor, nor even my favorite buteo, like many birders and most bird photographers, my favorite anything is whatever happens to be in front of my binoculars or lens at the moment. Still, there is something about Swainson's whose name honors William Swainson, a prolific nineteenth century English artist and naturalist, that delights. Undoubtedly it is the aspect of the kettle numbers itself and the wonderful variety of Swainson's plumages in sight at one time, all roiling, intersecting, appearing then disappearing, like giant brown and white snowflakes, all similar, none exactly the same. Because Swainson's are rather common in the grasslands of the northern plains and southeastern Arizona, birders rarely seek them out and forget how special it is to encounter autumn migrants in a kettle. Swainson's come in six flavors. There are three color morphs--light, intermediate or rufous, and dark--and the juvenile plumages are strikingly different than adults. Light morph adult plumage is the one most typically seen and most easily identified to species, from below the light/dark pattern of white forewing contrasting so obviously with the dark remiges or flight feathers. That plumage is everyman's Swainson's, about the size of a Red-tail but slimmer with pointier wings, more buoyant and less bulky looking. The light morph juvenile, though, will not show much contrast on the underwing, the diagnostic dark chest band of the adult is not complete, and there is beautiful milk chocolate speckling on the underparts, heavier along the flanks, thinner across the belly. Intermediate and dark adults will not show the telltale underwing contrast or white underbody. Intermediates are a rich rufous underneath, and dark morph birds are dark brown below with rich rufous on the leading edge of the wing. Though the actual patterns are different, at first glance adults of both these morphs can be reminiscent of Harris's Hawk adults because of the initial visual impression of the rufous and dark areas. 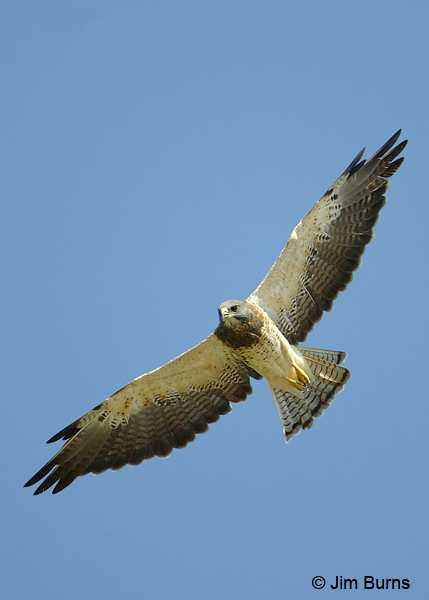 All three adult morphs show dark "commas" at the wrists of the wing and lack the diagnostic dark patagial bars of the Red-tail. It is the intermediate and dark morph juveniles that, in this photographer's lenses, become the eye candy of the Swainson's tribe. The dark speckling on the underparts becomes thicker and extends the length and breadth of the bird's body, the individual speckles a wonderful dark chocolate taking on the distinctive shape of hearts and diamonds, all against a buffy to light rufous background, each bird displaying more or fewer hearts and diamonds than its neighbors in the kettle which won't be its neighbors for long as each catches a different current channel, tilting, swooping, occasionally flapping, a virtual kaleidoscope of jeweled avian shapes. The fun is trying to follow one individual bird from field to kettle top without losing it or becoming distracted by another even more distinctively marked. Swainson's, unlike all the other buteos which acquire adult plumage after their first molt, take two years to come into adult plumage. Swainson's are graceful fliers, and they are "kiters," hovering effortlessly over perceived prey items in the fields below much like the eponymous family of small hawks from whence came the term for this method of hunting. And, if you thought the avian kites received their name from the child's toy, you would be wrong. Actually the reverse is true, child's toy named for the bird. During breeding season, while feeding young, Swainson's take rodents and snakes, but for the remainder of the year the favored prey item is large insects, primarily crickets and grasshoppers, which they capture by dropping from the sky or run-hopping through recently plowed fields. They will follow working tractors, watching for disturbed rodents and insects, they are well known for taking insects on the wing, and they have been observed feeding through swarms of bats. Small birds are sometimes taken but apparently not preferred due to the additional amounts of energy required. Huge flocks of Swainson's build up along some migratory routes which seem to be favored and used year after year. These fields along I-10 through the Santa Cruz flats must be the Swainson's supermarket, and the store is open dawn to dusk, the hawks resting by day and roosting by night in the shelterbelt trees around the perimeter of the fields or the farm homes in the area. This particular kettle has drifted away from me twice only to reappear out of hawkless skies after a hiatus of twenty hawkless minutes. Why did they leave, where did they go, and why did they come back? Perhaps this is a different group of birds intersecting the same rising thermals. For sure it would be impossible to recognize individuals in the milling, swarming masses. This kettle, or three kettles as it may be (is it the air thermal itself or the birds which actually bear the designation "kettle?") 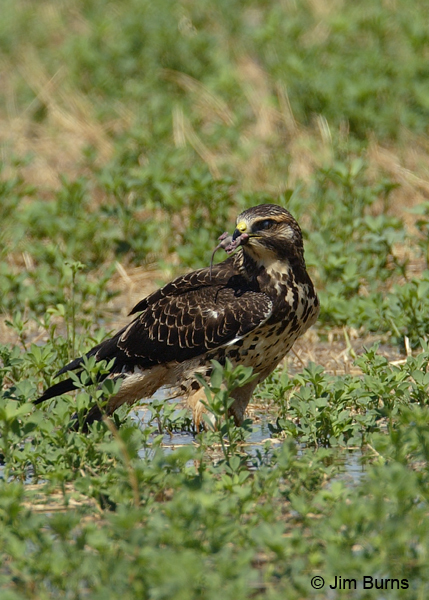 contains about 70% juveniles and about 98% light and intermediate morph birds. I am always left wondering whether the dark morph birds are really more beautiful or just seem so because of their rarity. Perception is reality. Across the roadway another bare field is beginning to receive irrigation. Along its sparsely vegetated margins, a Swainson's has dropped into the grass, intently interested in something on the ground. I decide to go for it. I dismount the lens, jump in the van, and creep it slowly toward the bird. This is a striking intermediate juvenile, its speckles forming huge dark diamonds entirely across its creamy underparts. Oblivious to everything but the rustling at its feet, the bird does not spook as I cut the motor and balance the 600 out the window on a beanbag. The light is not perfect, quartering in from the right, but no matter. Action on the ground trumps both flight and portraiture. The hawk hops, swivels, then pounces. The needle that is its beak jerks downward toward razored talons. One sharp jab and the small, short life of a mouse has flickered out, its denouement exposed to my searching lens. Forgetting to breathe, I depress the shutter button and hold it down until the buffer is full. My camera sits atop this food chain.